The time between each frame is .1 seconds. Grant Hackett's time for the 800 m freestyle event was 7:38.65. The swimmer performed the race in a questionable manner. At the 500-m turn, he was more than five seconds under Ian Thorpe's existing world record. In the last 150 m, he slowed noticeably to still record a new world record, breaking the old one by less than a second. This analysis is offered to evaluate any special technique changes that led to the faster than expected velocity in this point in the race. Frame #1: The right arm enters as the left arm begins its functional pull. Good streamline is exhibited. The left leg has just started its kick. Frame #2: This frame exhibits the "parking of the arm" phenomenon that characterizes the stroking of Ian Thorpe and Grant Hackett. This is not a deliberate overtaking stroke. It is caused by the underwater repositioning and propulsive phases taking much longer time than the quick recovering arm. That imbalance requires the recovered arm to be "parked" until it is time to commence its repositioning and propulsion. Here, the right arm is parked and the left arm continues its pull. The forearm and hand are almost vertical. The left foot kicks as part of a six-beat kicking cycle. Frames #3 - #5: The right arm continues to be parked. The left arm has pushed directly backward with the hand and forearm appearing to be the major propelling surface. The swimmer's streamlining is very pronounced. Frame #6: Most of the left arm has exited the water with the hand the only remaining part under the surface. The right arm is still parked. At this time there is no propulsive force being generated. This inertial lag initiates a slowing in velocity. Over long events, these periods of negative acceleration accumulate and cost the swimmer many seconds. Frames #7 - #9: The right arm is repositioned to where it can create an effective propulsive force. The left arm is recovering. The left leg kicks to counterbalance the vertical forces created by the vertical movements of the right arm. Frame #10: The right arm is exerting substantial propulsive force. The whole arm is a propulsive surface. That fixed surface is powered by strong abduction and then adduction of the right shoulder. Good streamline is maintained while the legs continue with their six-beat cadence. The left arm approaches entry. Frame #11: The left arm has entered and is extended out and to a minor degree down. The right arm continues propelling. Frame #12: The swimmer exhibits his usual adjustment with the right arm. It is raised and straightened to be parked with minimum resistance. The length of the backward propulsion of the right arm is demonstrated. Frame #13: Grant Hackett's length of stroke (right arm) is notable. Perhaps this is a feature of his stroke. Most coaches attempt to lengthen a stroke by having swimmers reach forward more. However, the more obvious and beneficial aspect to be lengthened in the stroke is backward, when propulsive momentum is highest. Frames #14 and #15: Another inertial lag is created when the right arm begins its recovery but the left arm remains parked. Frame #16: A large left-foot kick occurs to counterbalance both the left-arm repositioning (producing a vertical force component) and the right arm recovery. The repositioning of the lower arm and hand is achieved by keeping the upper arm and shoulder extended forward. Frames #17 and #18: The left arm continues to be repositioned as the right arm approaches entry. These frames are quite similar to Frames #1 and #2. The unevenness of Grant Hackett's stroke appears to be inefficient because of the differing inertial lags before the propulsion is initiated. The inertial lag for the right arm is .7 seconds (Frames #2 - # 9) and for the left arm is .6 seconds (Frames #11 - #17). This disparity is not as much as that displayed in other analyses in this section of the Swimming Science Journal. The unevenness has been described as a "lope stroke" (Dr. Larry Weisenthal, personal communication, June 2001). It is this writer's opinion that removal of the inertial lags to make the stroke consistently rhythmical would benefit the swimmer. However, with swimmers like Grant Hackett who have extensive histories of performing with purported technique "errors", there comes a time when one has to be cautious about changing a technique. 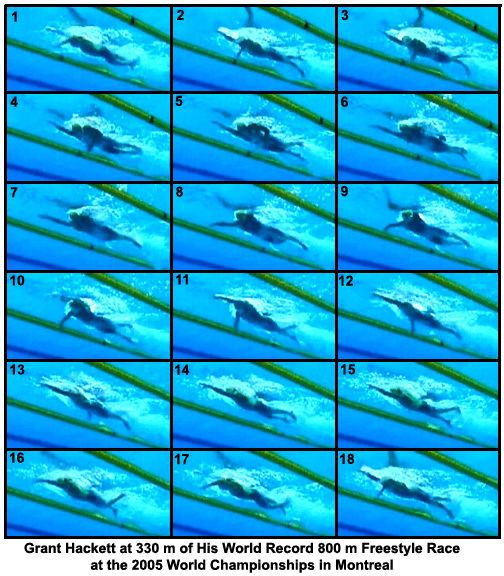 With every technique change, the swimmer will perform worse initially and then, as the change becomes more automated in the stroke cycle, the economy of the swimmer should surpass the level of that before the change. Some coaches would advocate not changing Grant Hackett's stroke because he is the world champion and now record-holder in two long-course events (800 and 1500m). However, swimming is a sport with an exceptionally high number of skill repetitions, which should stimulate relatively quick technique changes. Even if the inertial lags were matched to the shortest occurrence and the position of the entry arm, performance economy most likely would benefit. Frames #11 and #18 should be compared for propelling-arm position to see why this could be construed as an unbalanced stroke.